NetXpression allows you to publish your Powerpoint presentation or original content in many different forms. For low-bandwidth audiences you have the option to publish your presentation in a slide-show only “Standard Presentation”. 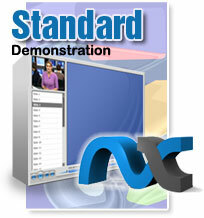 This sample NX Standard Presentation will give you a sense of how your own presentation would look on your web site. In this presentation, we will discuss the benefits of NX and take an in-depth look at how to create a basic online presentation using our easy to use software.